Tadia Rice’s keynote presentation of Lead With Aloha was uplifting, informative and refreshing. It should be shared with all people. She has a wealth of knowledge and information, and I want her to be my mentor! Tadia would be a huge asset to any group or organization. Her ability to connect with various individuals from multiple organizations is a true gift. Lead With Aloha, the keynote talk by Tadia Rice at the Live 2 Lead Conference, was impressive. Tadia Rice took the esoteric understanding of Hawaiian Aloha, so often misunderstood, and made it understandable for the western mindset. If more people in rest of the world could learn Tadia’s explanation of the Aloha spirit, especially as it relates to professional development, business, industry – all aspects of work and life, it would surely improve our entire society. I’m encouraging everyone I know, especially young women and men who question their leadership ability, to pursue it with Aloha because there is a such need for it. Tadia’s message that you can never neglect your own leadership capability was quite informative. She gives everyone the permission to lead unencumbered, fearless, with Aloha. If you feel it you have to follow it! Aloha is a very deep part of Hawaiian culture. It’s the cultural foundation from which my people live. 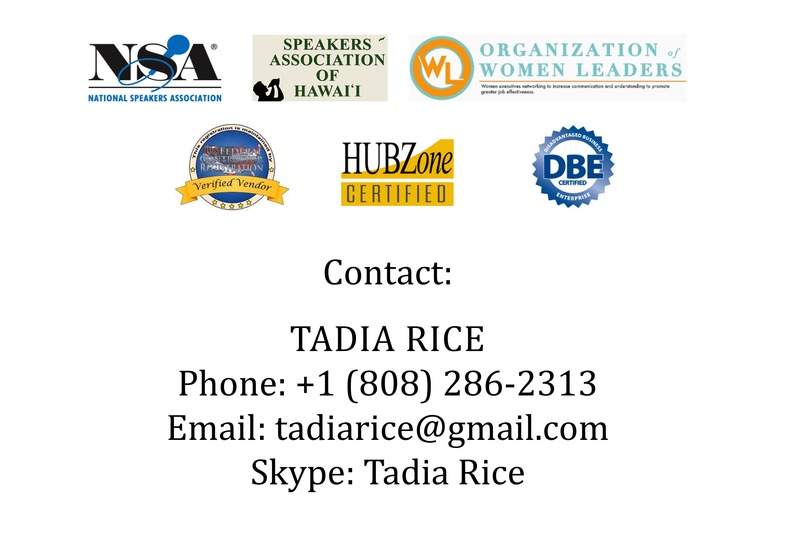 Yet, what I learned from Tadia Rice was to Lead With Aloha, and that helped me expand my own understanding of how to apply Aloha in the workplace, as well as in all relationships. It starts with each one of us. We can’t give what we don’t have, so it’s important to learn, live and lead with Aloha because as we begin to love and respect ourselves we can take that power to the community. When we better understand Aloha we can live it. Tadia said it best: It costs us nothing, yet we gain everything. Tadia Rice is impressive, an extremely talented leader in her own right. I learned so much from her empowering presentation Lead With Aloha. This is a program that every visitor to Hawaii should experience! Having been born and raised in Hawaii, I was amazed that I didn’t understand Aloha. So many of us flippantly use the word only for hello, goodbye and love, but what Tadia Rice shared was quite impressive. Lead With Aloha gave me a deeper understanding that it’s often more about what is not said than what is. My big take away was Tadia’s explanation about servant leadership, and how mastering that with Aloha gives us the ability to strengthen our entire team, no matter what industry we’re in. Tadia is a great presenter who knows her material extremely well and engages with her guests. I would recommend her for any Conference Presentation requirement. As a public personality and long-time entrepreneur who speaks often, I applaud Tadia Rice! Her ability to inspire and manage an audience was reflected during her presentation on Gender Equality presented to the Honolulu Pacific Federal Executive Board of the US Government. Her content was not only reflective of the challenges facing our society, but Tadia provided real world options for women and men who want to build parity and opportunity for themselves and their children. Tadia can speak on many topics of wide-ranging interests, from leadership and business management to Hawaiian Aloha and geopolitical issues. Whatever the issue, you can be sure she will speak from her heart and her broad range of experiences. I recommend and endorse Tadia for her enduring efforts to promote equality and human rights for all. She will definitely enhance and enrich your any program. Thank you for your remarks and presentation at our Honolulu-Pacific Federal Executive Board’s 2013 LEAD Conference. Many found your remarks both enlightening, entertaining, and highly relevant to the theme of empowering women. Your articulation of the challenges of reaching gender equality, and of ensuring that members of the next generation are reached, was particularly well received. Following Congresswoman Tulsui Gabbard was no easy task, but your participatory and engaging style, as well as the details presented on your global experiences with women’s issues, was a very valuable contribution to the event. Thank you so much for your generosity in supporting this important training event to the Federal workforce. Warmest mahalo. Tadia, you delivered one of the more memorable presentations I’ve ever experienced when you were our keynote speaker during the 2013 Women’s Equality Day celebration at the Ford Island Conference Center. The lead delivery by the Honorable Tusli Gabbard was quite impressive. I wondered, ‘How does one follow such a sound speaker and presentation?’ As evidenced by the interaction and praise from the audience, your presentation blew the roof off of of the building… it was awesome! You were introduced as a motivational leader with a “lifetime experience as an agent of change.” This was an understatement. The very personal manner in which you interacted with the audience… coupled with your meaningful message concerning men and women working as one, breaking down the long-standing discrepant paradigm of women being less valuable than men… touched everyone in the audience. It is with high regard that I say it was a pleasure to be in attendance and experience the impact you have on audiences. Tadia Rice is brilliant. She brings a lifetime of knowledge and experience from her work in many parts of the world. Tadia has helped organizations solve difficult and sensitive problems. Her creative approach makes her presentations fascinating, thought provoking, and unique. Tadia teaches us new ways of thinking, acting, and being in the world. She is a gifted musician and actress. It has been a pleasure for me to hear Tadia speak. Thanks so very much for an excellent presentation during our LEAD conference on gender equality. You made our seminar the total hit it was! You are a class act and good at what you do! You know your subject and enjoy what you do. It is infectious! I enjoyed how you provided valuable and informative information in such an entertaining way. Mixing humor with facts got your points across to the audience in a wonderful way. I also enjoyed the way you interacted with the audience. It brought the message home when you see others validate and back up what you are saying. I look forward to hearing you again! Tadia Rice embodies the passion, spirit, intellect, and wisdom to articulate and convey messages to a diverse audience. Whether it be a classroom, business presentation, one-on-one, or to the masses, her essence and ability to reach each and every individual in a room was inspiring. Tadiaʻs ability to relate former human and civil rights leaders Nelson Mandela, Martin Luther King Jr., and Malcolm X to the Hip-Hop generational leadership in the likes of Tupac Shakur was stunning. In the age of social and new media, Tadia’s ability to engage the live audience brings forth a renewed spirit of joy and conversation. Tadia proved herself as an amazing presenter! Tadia Rice is an enthusiastic passionate speaker who discusses current truths and realities in a way that puts an audience at ease. She brings a wealth of knowledge and experience with her that validates her messages and encourages others. Her presentations are welcoming and engaging. Her thought provoking messages induces personal reflections while examining personal convictions. Tadia will leave you with a sense of hope, unity, and commitment to yourself and others. I truly enjoyed Tadia’s presentation on Womenʻs Day. Her treatment of gender equality – what it looks like and how to achieve it – was illuminating. I highly recommend her services to others! Tadia Rice’s “Change” was a breathe of fresh air presentation… entertainment with a message. Mahalo nui loa. Her information helped me review my process of who I am, my purpose, and how I become a better person. Tadia’s guidance is the new addition in my foundation for personal and professional success. A hui hou, malama pono! In the field of communications Tadia Rice is peerless. Every occupation has persons that can multi task, and Tadia is the complete package. She is well traveled in her profession, from the West Coast of the United States to the East Coast, to Johannesburg in South Africa and now to her abode in the Hawaiian Islands. Tadia has always devoted herself to the communication of higher principles in the world, whether with her two CDs of Tahirih or her book about the women of post-genocide Rwanda. Wherever Tadia has lived she has embraced, and been embraced by, the culture of the people that live there. She is one of those people who is easily assimilated into a culture because of her own outgoing and friendly attitude, and because of her acceptance of the principle of the oneness of the human race, which is cardinal to the Baha’i Faith. Her talk on the Spirit of Aloha and the Baha’i Faith reflects all that she stands for. Tadia Rice is a fabulous keynote speaker. She engages the audience with a creativity that makes every word food for thought. She motivated me to make a difference in myself. Her breadth of business knowledge and personal wisdom helped me clarify what is important and what will maximize my company’s performance. No nonsense and to the point, Tadia’s advice helped me better understand my customer’s needs, and assisted my ability to create a win-win environment with every client. Wow! Tadia Rice’s keynote speech entitled “Shift Happens: Seeing Beyond Your Own Horizon” was amazing. She led the audience on a provocative journey that peeled away our stereotypes and exposed our hidden prejudices. Her approach was dynamic, innovative, interactive, and thought provoking. Tadia wove together aspects of diversity that dispelled old belief systems. I laughed as Tadia identified familiar behaviors, and learned so much from her about emotional intelligence and creating patterns for empowerment. I experienced “ah-ha” moments that helped me move toward positive action. You are so very inspiring. You motivated me to motivate my patients, and your message about personal transformation applies to everyone, whether in the workplace or at home. The information about “Ren” has helped me to understand better how to integrate attitude, skill, and knowledge. Thank you for incorporating this important Chinese teaching, as well Hawaiian culture you shared, in your presentation. I hope to attend more of your talk in the future, if for no other reason, to see what you do to open what becomes a wonderfully entertaining, deeply moving, and educational presentation. I really enjoyed the presentation on “Change.” I have never seen a presenter do what you did. When you came out in the Aloha gear and made a quick change into your professional attire it was sheer entertainment! Your fun exercises were great, and the assessment questions gave us all a quick, but real picture of where we are in our lives. I look forward to seeing more presentations from you in the future. When Tadia Rice gives a talk, I’m there. Front row and center, whether small soiree or large stage. I’ve known her a long time and seen a lot of sides to her: brave, courageous, funny, articulate, a tireless promoter of events that benefit humankind. A week ago she spoke about one word, make that “concept” of one word: Aloha. I knew precious little other than a vision from my mind’s eye of tourists getting off an airplane, having colorful lei placed like a necklace around their throats, and natives saying, “Aloha.” Well, Tadia articulately and lovingly cut to the chase, and expressed the concept and deep meanings to the traditions of Aloha. Her eyes speaks with laughter, her soul with honesty, and she brings a total engagement with her audience. Never again, will I take the word Aloha casually into my heart. Tadia was profound as she compared this Aloha concept to her Faith and the world. We were mesmerized and enchanted. It was an incredible experience.